Simon Cowell is reportedly planning to buy a house next door to Justin Bieber in the Oaks Calabasas neighborhood. The ‘X Factor’ boss is said to be in talks with an estate agent to buy a six-bedroom, $9 million home in Los Angeles for his new family in the gated community of Calabasas. You have to wonder whether Simon’s people are even aware that Bieber lives in the neighborhood. If he does move here with his family, he should know that the kid is a non-stop menace when he’s in residence, throwing all night parties with his pals and generally wreaking havoc. Simon was apparently very excited when they sent him the details of The Oaks estate. But no one mentioned the fact – perhaps because they didn’t know – that Justin Bieber will be one of his neighbors. Meanwhile.. Justin has been in Atlanta for few weeks — and is reportedly hunting for 2nd house in Atlanta to get away from the paps in Los Angeles. Keep in mind that when you hear news about Justin on the Radio or TV or other gossip sites, it often originates from TMZ. So they repeat the same stuff right or wrong. When TMZ reported there was a plea deal in the DWI case, everyone repeated it-they were all wrong; there was no plea deal. The same thing with the he spat on fans-a lie. Who cares if Simon is moving to Justin’s neighborhood, if he wants to, then he can. Why are people making a big deal out of this? Simon can live wherever he wants, just like Justin can. That’s the usual stupid article on Justin from the Daily Star; he’s hardly ever in that neighborhood. Many parties were thrown when he was not there by Twist and others. Also, He has not egged HOMES but is alleged to have egged ONE home ever. We still don’t know if he will be charged. Those jackasses in the Media should get their facts right. Yay!!! Simon and Justin will become buddies! Justin is changing back for the good. His issues that started the whole thing was his breakup with Selena. @justineee ur sick, he changing to be a better person but some people won’t let him be.. E.g like u saying he’s turn to be worse, instead of saying he’s trying to be a better person ur saying negative crap.. Plz enough.. Da news is full of lies etc. TMZ is news. Most of the news that make headlines come from TMZ, like the fake DUI arrest where they framed him. How can you say he’s a bad person when YOU’RE the one making your opinion about what you hear on the news? This website gives the news that they give on tv, so we technically are getting accurate news. How can you say he’s a bad person, when he spends so much time making music for his fans, even on his 20th birthday? When he is constantly donating money to help kids in need, such as when he donated 600,000 to the philippines? Instead of focusing so much time on what Justin Bieber does, maybe you should spend more time examining yourself, because you’re probably no better. Just wasting your time hating on a 19-year old. Maybe Simon knows. I bet he has just as wild parties as Justin does. Maybe he wants to party with Justin, who knows. 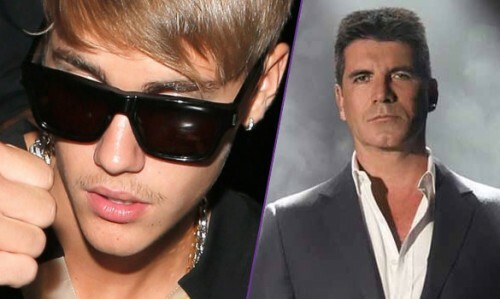 Perhaps Simon Cowell wants to keep an eye on Justin Biebers brand. He needs to know how Justin became so wealthy in just a short period of time. Rich is not good enough, you have to be wealthy. The down fall of Justin means no competition for 1D, and no competition for Taylor Swift. In my comment I said “perhaps!” Only he knows why he wants to move too Calabasas? It’s probably all lies and more rumors. Just rumors and BS.